The Rationalist Society of Australia Inc. seeks to promote a pluralistic, multicultural and secular Australia. Government policies and laws should be based on evidence, reason and compassion, not religious beliefs. Everyone should be free to follow their own religious or non-religious worldview, provided that doing so does not harm or unnecessarily restrict others. The principal authors of this submission are Chris Fotinopoulos and Jonathan Meddings, members of the RSA board. There are currently limited means available to adults of sound mind to die on their own terms. There are also few legal avenues presently available to those who choose to die peacefully and with dignity. Terminally ill patients to end their lives on their own terms, and with the assistance of a physician if they so require. Those who may not be terminally ill in the near future but express intolerable existential suffering, such as people who are facing a life of slow but inevitable decline as a result of dementia, to end their lives at a time of their own choosing, with the assistance of a physician if they so require. Central to medical ethics is an understanding of patient autonomy, choice and dignity. In a secular liberal democracy such as ours, the individual ought to be free to organise and conduct their life in accordance with their personal values, principles and preferences, provided they do not harm others. Therefore, no person should be forced by the state or by a religious institution to die in a way that contradicts his or her values. As John Stuart Mill asserted in On Liberty, "the only purpose for which power can be rightfully exercised over any member of a civilised community, against his will, is to prevent harm to others. His own good, either physical or moral, is not a sufficient warrant ... Over himself, over his own body and mind, the individual is sovereign." As it stands today, the law compels certain people to die in a way they abhor and cannot easily escape. This is particularly prevalent in hospital settings and inpatient hospices, where terminally ill patients are prohibited by law to exercise the autonomous right to die in a way that conforms to their values, principles and preferences. If a person is capable of ingesting a life-terminating drug, then it ought to be legal for doctors to offer guidance, provide technical assistance, and oversee the procedure to ensure it is conducted appropriately without unwanted detrimental outcomes. If the individual is not physically capable of administering a life-terminating drug, then a physician ought to have the legal authority to actively administer the drug on behalf of the patient, provided all safeguards are met. We appreciate and agree that appropriate safeguards must be included in end of life legislation. Currently it is unclear if doctors are acting lawfully when taking action. It is imperative we decriminalise actions taken by a doctor to assist a person to die, so they do not have to fear the threat of legal prosecution. This could be done by amending the Commonwealth and State Crimes Acts to include a defence for the charge of homicide or manslaughter if a doctor has prescribed or administered a drug that has caused or hastened the death of a patient. The law as it currently stands on euthanasia restricts control and choice for certain terminally-ill patients by denying them access to death-enabling drugs, information on how to administer such drugs, and appropriate medical support, including a physician’s assistance. We contend voluntary euthanasia laws would not diminish the value of human life. Rather, they would enhance the prospect of a peaceful death by shifting control away from the state and other institutions, and into the hands of the individual, empowering them to achieve what they believe to be a good death. The table on page 1 is the best description we have come across to characterise what constitutes “a good death”. Denying a person experiencing physical, mental and existential suffering the means to death is a form of cruelty because it prolongs unnecessary suffering. If we are committed to delivering a good and peaceful death to all, then the law must extend greater control and genuine informed choice to all Australians. Currently in Victoria, the Medical Treatment Act allows people to complete an advance care planning form. But it is not legally enforceable, nor would it apply to Victorians who happen to find themselves in another state. The importance of self-empowerment was poignantly highlighted by Dying with Dignity campaigner Peter Short, who died in December, 2014. In an interview for The Age last year, he said "If I didn't have the choice and control, I would be terrified". Choice permitted Peter Short to die happy and in control. About a month before he died, Peter told one of the authors of this submission, Chris Fotinopoulos, that it was not death that he feared, but his inability to govern the remainder of his life. Peter was a fiercely independent person determined to live the best life his health circumstances permitted, and he saw our anti-euthanasia laws as an impediment to finishing his life well. Dr Rodney Syme, who gave Peter Short advice and access to life-ending medication, said at Peter’s eulogy, "Having Nembutal didn't shorten his life – in the end he chose not to use it. Ultimately Peter died in palliative care. What Peter was arguing for was choice, and in the end he exercised choice; the actual choice he made is not important, the fact that he had a choice is what matters." The final message posted by his wife, Elizabeth, on Peter's blog, also highlighted the importance of choice: "The fact that Peter had the knowledge and the means to end his own life was an invaluable part of his palliation. It allowed him to live the remainder of his life exactly as he wanted ... He did not fear the end as he knew it was his to control." Self-empowerment of this kind can lead to the terminally ill living longer, happier lives. This is probably because when terminally ill individuals have access to the means to end their lives peacefully they know they can end their suffering at any time, if needed. This is reflected in statistics from Oregon, which has had a Death with Dignity Act since 1997. Of the 1,300 terminally ill people who received legal prescriptions for life-ending mediations since 1997, only about two-thirds actually used the treatment. Although patient autonomy is of central importance, we recognise that individuals will not always have the capacity to make their own decision. In order to maximise individual choice, we propose voluntary euthanasia advance directives be included in the National Electronic Health Record. Doctors should be trained to have conversations with their patients about end of life choices, and remind them to make sure their advance directive is updated on their electronic health record. In the event patients still have not indicated their desired choice, and are unable to communicate or make such a decision when the time comes due to being incapacitated, and if a doctor believes they are unlikely to recover their consciousness or capacity, we propose a hierarchy of choice in which the ability to make end of life decisions is deferred to the family, or if there are no family members, then to a doctor. The law as it stands tends to restrict a “good death” and therefore dignity to those who are fortunate enough to die at home on their own terms. We contend it is unethical for the state to use its powers to deny a dying person the dignity of dying at home. The laws as they stand compel those who wish to die on their own terms to resort to violent and undignified means. Australians are free to die through shooting, hanging, leaping off a cliff or into the path of train. Other ‘legal’ means such as the exit bag, whose components can be legally obtained, are considered undignified by many. Some patients find death while under palliative sedation repugnant, and may find other forms of palliative care unacceptable. Patients should not be required to submit to treatment against their wishes. To do so is to impose an undignified death. This contradicts the commonly held view that assisted dying would decrease if other options for dying patients, such as palliative and hospice care, were readily available. 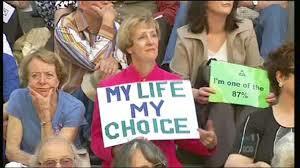 Physician-assisted suicide - when an individual is given the means and information needed to end their own life. Active euthanasia is generally achieved through intravenous injection of a lethal substance. Physician-assisted suicide usually means the person self-administers the life-ending drug. Currently the laws against voluntary euthanasia discriminate against the sick, the poor and the isolated. Those who are well-connected and still reasonably well are more likely to be able to access the means of voluntary dying; people who lack such connections, or who are institutionalised, isolated, or just too sick, are condemned to suffer what others decide for them. Doctors already assist patients to die, albeit covertly to avoid legal repercussions. As reported by Sydney Morning Herald journalist Julia Medow, several Melbourne doctors admitted to helping patients to die. They did so out of compassion and their professional duty to help their patients die in the way they wanted to. One doctor interviewed for the article but wishing to remain anonymous said, “this is happening all the time, it's just that the media are not hearing about it." It is impossible to know the extent to which such covert life-ending practices are happening in Victoria and throughout Australia. According to the doctors interviewed, those who help their patients die at home make no mention of suicide or euthanasia on the death certificate. Doctors such as Rodney Syme, Simon Benson and Philip Nitschke have admitted to covertly supplying death-enabling drugs to a number of patients to draw attention to the absurdity of the current situation, but have yet to be charged. To ensure greater transparency and accountability, the law needs to catch up with these clandestine life-ending practices. Covert euthanasia is fraught with danger because secrecy can hide incompetence and abuse. Legalising euthanasia would render covert practices unnecessary, and ensure high standards are maintained in prescribing life-ending drugs. Should the law change to allow physician-assisted dying, doctors and health professionals will need to undergo additional training to ensure best practice and to educate about the ethics of end of life choices. While it may represent some infringement on patient choice, we believe permitting family or friends to administer a life-terminating drug, rather than a qualified medical professional, should not be allowed. It is possible certain family members may have a vested interest in the patient’s death and we believe this risk ought to be avoided. Further, physicians who assist patients in this way must have no vested interest in the death. In 2011, 4.8 million (22%) of Australians chose the “No religion” option on their Census form, and the number of non-religious Australians is growing. We believe secular palliative care should be readily available to the many secular Australians who require it. We were unable to find data about the availability of such services, perhaps because none exists, but it is reasonable to assume a large proportion of palliative care providers are run by religious organisations. We would recommend data be collected to determine the extent to which secular palliative care services are available, and efforts made to increase their availability. Some doctors are understandably uneasy talking about killing, for fear of being characterised as insensitive, dangerous or criminal. Some doctors argue euthanasia contradicts the Hippocratic oath, emphasising that medical discussion should focus on healing, helping and offering hope. But as health professionals who care for the terminally ill know, this is not always possible. People continue to die horrible deaths, usually in a hospital setting, that could have been averted if not for state-imposed restrictions. We contend a physician is not harming a patient when they assist them to peacefully end a life of unbearable suffering. Rather than engaging in ‘heroic medicine’, ever fighting to prolong life no matter what its quality, we suggest the medical profession – and the general public – should be encouraged to shift its attitude towards fighting for the things that make life meaningful for the patient and to respecting the patient’s wishes regarding a dignified “good death”. Legalised active euthanasia in 2002 for terminal and non-terminal patients. On average only 6.6% are non-terminal and most of these cases have neuromuscular diseases. The law requires approval of two doctors, and a psychologist if competency of the patient is in doubt. Colombia’s Constitutional Court ruled in 1997 active euthanasia is allowed when terminally ill (and only terminally ill) patients authorize it. The ruling did not consider degenerative diseases as terminal. In April 2015 the Health Ministry released guidelines for doctors, who despite its legality had been hesitant to assist their patients to die due to a lack of regulation and fear of criminal charges. Legalised passive euthanasia in 2005. It legalised a form of passive euthanasia combined with deep and continuous sedation until death in March 2015. Active euthanasia is still illegal. Legalised active euthanasia in 2008/9 for the terminally ill, who have to get approval from two doctors and a panel of experts. The Netherlands legalised euthanasia and physician-assisted suicide in 2002. Oregon, Washington, Vermont and Montana have legalised euthanasia but it remains illegal in the other 46 states. The Oregon law has demonstrated an absence of abuse, proving that with appropriate safeguards, the concerns of those who advance a slippery slope argument are unfounded. Only a doctor can euthanise a patient. These guidelines are not legally enforceable. The narrow definition of euthanasia does not include instances of non-voluntary euthanasia, which are performed by removal of feeding tubes and continuous deep sedation of patients who are unconscious. It may be suggested the use of the term “unbearable pain” used in the Netherlands guidelines is too subjective, relying on the person’s own assessment of their condition, which may be temporary and treatable. To avoid this ambiguity, we suggest legislation refer to “irremediable suffering”. The term “irremediable” implies there have been options offered and action taken to remedy the suffering but these are ineffective or no longer effective. As highlighted by the case of Beverley Broadbent, we note there is a strong in-principle argument to be made in support of rational suicide on the grounds of patient autonomy. Rational suicide is when someone is mentally sound (and in particular, not depressed) and (reasonably) physically healthy, but for rational reasons desires to peacefully end their life. While strongly in favour of patient autonomy, we also note that in practice any legislation in support of rational suicide would face enormous social and regulatory challenges. Amends the Commonwealth and State Crimes Acts to include a defence against the charge of homicide or manslaughter if a doctor has prescribed or administered a drug that has caused or hastened the death of a patient. Patient preferences, in the form of advance care directives, are recorded on a register, such as the National Electronic Health Record (NEHR). Swerissen, H and Duckett, S (2014). Dying well. Grattan Institute.